"Flash" was sired by that great producer Hazelbarrow Jude Imp UK out of our Ch.Audrey of Bernolga. 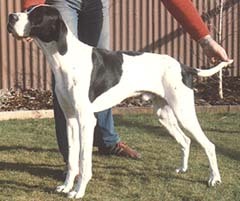 "Jude" was a son of the famous Ch.Crookrise Flint, and although not shown in competition he proved to be a very successful sire and revolutionised the breed in Australia much as his sire did in the UK. We were the only breeders in N.Z. to use him, but we feel it was worthwhile. A handsome Black & White dog he tended to be overshadowed by his sister Ch Porthcurno Touch Of Gold but nevertheless he was a good show dog. Unfortunately he injured his hind leg in an accident as a youngster and this cut short his show career. Lightly used as a sire he has given us Porthcurno Who's A Flirt, owned by our friend Julie Batchelor (Derwent Pointers), who is the dam of Porthcurno Blue Peter sired by our Ch.Crookrise Old Glory (Imp UK).